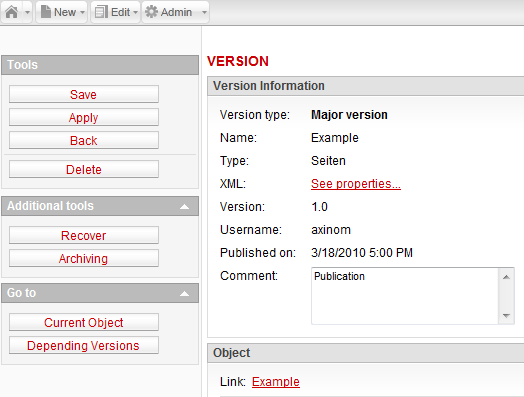 AxCMS.net supports versioning. 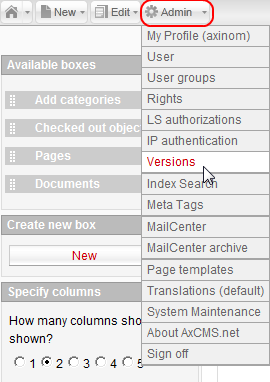 Versions are related to pages and documents. 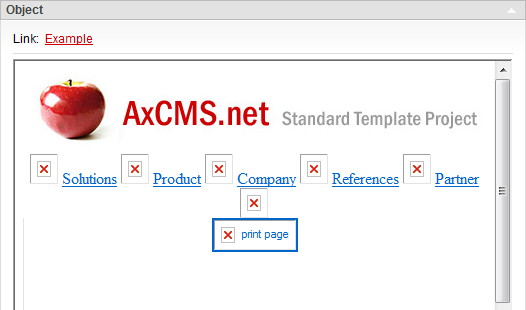 There are two types of versions in AxCMS.net - major and minor versions. Major versions are generated each time a document or a page is being published and are represented with whole numbers (1.0, 2.0, 3.0, etc.). Minor versions are generated each time a document or page is being modified without publishing. Minor versions are represented with the small numbers following the whole number of the major version (1.1, 1.3, 2.9, etc.). To view and edit versions, go to Admin -> Versions. You will be redirected to the versions overview page where all the versions of pages and documents are displayed in a list. In the filter section you can search for a particular version of a page or object using the filter parameters. By unselecting the only major checkbox, you can see all the versions of the pages and documents (major and minor) with comments explaining each change that was made to the page or document. To view a certain version, click the Edit icon near the corresponding version name in the list. The detail page of the version opens. Saves changes to the currently edited version. You are taken back to the version overview page. Saves changes to the currently edited version. You remain on the version detail page. Takes you one step back to the previous page. Deletes the currently edited version. Clicking this button will recover the object the current version is related to and set it to the point of the current version. The current version will be placed to archive. Clicking this button will take you to the detail page of the object the current version is related to. Clicking this button will take you to the list of all versions depending on the currently edited. Version type of the object (major or minor). XML view of the object (with See properties link). Version numeric designation (e.g. 1.5). Username of the last editor of the object. Date and time when the object was published. Details of the action executed on the page or with the object (e.g. Add: Label(ID:9)). This section contains a preview of the selected object with a link to it.